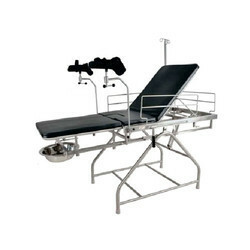 Leading Manufacturer of ss telescopic labour table from Hyderabad. Complete Stainless STeel tubular base frame and rectangular top frame. CNC machine pressed & double bent three section stainless steel top. Backrest adjustable on ratchet mechanism. Trendelenburg and Anti Trendelenburg position with manual crank mechanism. Leg section can be telescoped under main body section for lithotomy position. Fixed middle section with perineal cut. Sliding fluid collection bowl underneath leg section. Three side removable stainless steel side railings. One stainless steel IV Pole. Three Section 25 mm Thick PU Foam mattress with safety belts. Pair of height and width adjustable stainless steel lithotomy rods with knee crutchces. Legs fitted with heavy duty floor protecting PVC Shoes. MS Powder coated frame work thre section SS top. Backrest, Trendelenburg and Reverse Trendelenburg position using Gas Lift Mechanism Operated. Looking for Telescopic Labour Table SS ?